Vicente V. Torres, Jr. (Vicente), Mariano Velez (Mariano) and Carlos Velez (petitioners) filed a Complaint before RTC Cebu City praying for the nullification of the sale of real property by respondent Jesus Velez (Jesus) in favor of Lorenzo Lapinid (Lapinid); the recovery of possession and ownership of the property; and the payment of damages. Petitioners alleged in their complaint that they, including Jesus, are co-owners of several parcels of land including the disputed Lot. No. 4389 located at Cogon, Carcar, Cebu. Sometime in 1993, Jesus filed an action for partition of the parcels of land against the petitioners and other co-owners before Branch 21 of RTC Cebu City. A judgment was rendered based on a compromise agreement signed by the parties wherein they agreed that Jesus, Mariano and Vicente were jointly authorized to sell the said properties and receive the proceeds thereof and distribute them to all the co-owners. However, the agreement was later amended to exclude Jesus as an authorized seller. Pursuant to their mandate, the petitioners inspected the property and discovered that Lapinid was occupying a specific portion of the 3000 square meters of Lot No. 4389 by virtue of a deed of sale executed by Jesus in favor of Lapinid. It was pointed out by petitioner that as a consequence of what they discovered, a forcible entry case was filed against Lapinid. The petitioners prayed that the deed of sale be declared null and void arguing that the sale of a definite portion of a co-owned property without notice to the other co-owners is without force and effect. The trial court dismissed the complaint of petitioners. Aggrieved, petitioners filed their partial motion for reconsideration which was denied. Thereafter, they filed a notice of appeal, the Court of Appeals upheld the trial court's ruling. Was the sale between Jesus Velez and Lorenzo Lapinid valid? Art. 493. 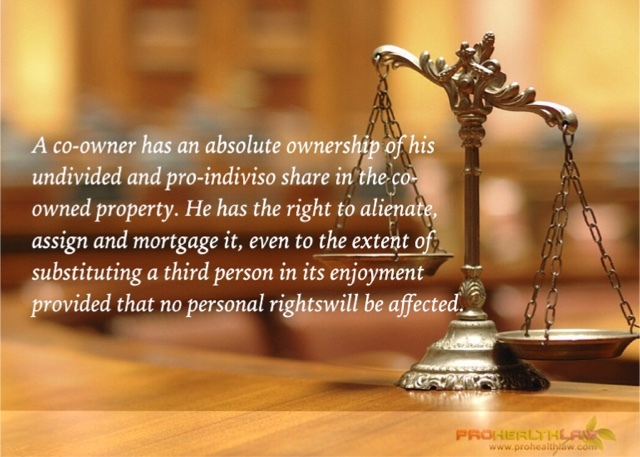 Each co-owner shall have the full ownership of his part and of the fruits and benefits pertaining thereto, and he may therefore alienate, assign or mortgage it, and even substitute another person in its enjoyment, except when personal rights are involved. But the effect of the alienation or the mortgage, with respect to the co-owners, shall be limited to the portion which may be allotted to him in the division upon the termination of the co-ownership. A co-owner is an owner of the whole and over the whole he exercises the right of dominion, but he is at the same time the owner of a portion which is truly abstract. Hence, his co-owners have no right to enjoin a coowner who intends to alienate or substitute his abstract portion or substitute a third person in its enjoyment. In this case, Jesus can validly alienate his co-owned property in favor of Lapinid, free from any opposition from the co-owners. Lapinid, as a transferee, validly obtained the same rights of Jesus from the date of the execution of a valid sale. Absent any proof that the sale was not perfected, the validity of sale subsists. In essence, Lapinid steps into the shoes of Jesus as co-owner of an ideal and proportionate share in the property held in common.Thus, from the perfection of contract on 9 November 1997, Lapinid eventually became a co-owner of the property. Even assuming that the petitioners are correct in their allegation that the disposition in favor of Lapinid before partition was a concrete or definite portion, the validity of sale still prevails. In a catena of decisions, the Supreme Court had repeatedly held that no individual can claim title to a definite or concrete portion before partition of co-owned property. Each co-owner only possesses a right to sell or alienate his ideal share after partition. However, in case he disposes his share before partition, such disposition does not make the sale or alienation null and void. What will be affected on the sale is only his proportionate share, subject to the results of the partition. The co-owners who did not give their consent to the sale stand to be unaffected by the alienation. VICENTE TORRES, JR., CARLOS VELEZ, AND THE HEIRS OF MARIANO VELEZ, NAMELY: ANITA CHIONG VELEZ, ROBERT OSCAR CHIONG VELEZ, SARAH JEAN CHIONG VELEZ AND TED CHIONG VELEZ,Petitioners, vs. LORENZO LAPINID AND JESUS VELEZ, Respondents. I want to share to you my knowledge about law, our travels with my family, success principles as well as healthy insights. I hope you will enjoy and learn from my blog.